I can still remember the excitement of going to the arcade at my local mall and playing my favorite arcade games as a kid. I was especially fond of the licensed Konami beat ’em ups like X-Men or The Simpsons and would play them with my brothers every time we were there. The nostalgia for arcade games is something I can relate to, so it comes as no surprise that there are some out there who would try to recapture the magic of arcade gaming in modern times. 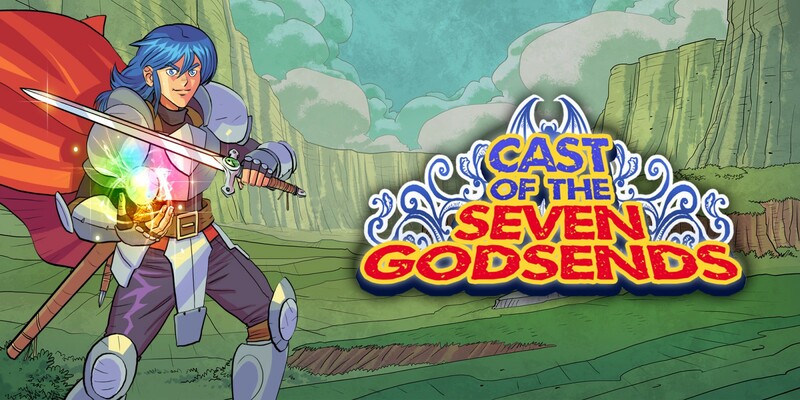 Cue Cast of the Seven Godsends, hoping to bring back the look and feel of the classic action platformers that once ruled the arcades, for better or for worse. Unfortunately, in this case, it’s definitely for the worse. In Cast of the Seven Godsends, you play as King Kandar, who must rescue his infant son from the clutches of the evil emperor Zaraaima. To do so he’ll need the aid of the seven gods of his kingdom of Dareca. By invoking their powers, King Kandar can obtain their abilities to fight the forces of the empire and he travels through six different worlds to protect his realm and reclaim the heir to his throne. It sounds pretty epic at first, but you’ll quickly find yourself eager to skip through the awful, grammatical error-laden dialogue. I at least managed to get a little entertainment by voice acting the story myself, as Kandar’s lines in particular, became far more entertaining when paired with an impression of the titular character from Everdraed’s Tails Gets Trolled animation. A run ‘n gun action platformer, Cast of the Seven Godsends is all about moving fast and shooting faster. Jumping over fiery lava pits, dodging vengeful spirits and avoiding hidden pitfalls is the name of the game. If you can collect 2 pieces of armor you’ll be granted the right to call upon one of the seven godsends for assistance. By holding down the shoot button and letting go on the symbol of the godsend you want, you can gain their powers. Take too much damage though and you’ll be back at square one in your vulnerable leather armor (unlike a certain other knight, Kandar has the common decency to keep most of his clothes on after taking a hit). Unfortunately, many of the mechanics borrowed from the classic run n’ gun action platformers that CotSG hopes to emulate were best left in the past. The game is incredibly difficult in the way old arcade games were, when long vertical platforming sections with invisible pitfalls while dodging several annoying enemy attack patterns all at once were fair game. This might have been appropriate for arcades, which were intent on squeezing you for as many quarters as they could get, but now it’s just not very fun. Difficulty should stem from testing your skills, not patience. That’s not to say the game is too hard – there are 4 different difficulty levels to choose from, so you can always lower the challenge if you need to. I just wish the challenge in question weren’t so annoying. Additionally, your weapons are full of the worst attack patterns from the arcade classics of yesteryear. The infamous arcing weapons (think the axe from Castlevania or Ghosts n’ Goblins) are present in all their infamy, ruining stages by making hitting your target nearly impossible if they’re not standing in exactly the right spot. Ironically, many of the godsends meant to imbue you with greater power have some of the worst of these arcing projectiles. The fire godsend, for instance, gives you a downward moving fireball that bounces along the ground. This is extremely annoying against the enemies that have weak points you need to target later in the game and makes some mid-boss battles nearly impossible. I’d say at least half of the seven godsends have arcing projectiles so bad you’ll likely never want to use them. The art is just plain ugly. It’s trying to copy the style of 90’s arcade cabinet art, but no matter how you slice it it’s just not very good looking thanks to unappealing character designs and amateurish sprite work. The game’s animation style does it no favors either, with enemy sprites cycling through the same 2-3 frame animations repeatedly. I played GameMaker titles back in the early 2000s that looked better than this. As for the game’s music, it’s not memorable in the slightest – if I didn’t have to mention it in this review I likely wouldn’t remember it was there at all. Cast of the Seven Godsends is a collection of all the worst aspects of arcade gaming. Weak art, boring music, annoying difficulty, and terrible weapons all come together to make one very frustrating and mediocre experience. If you’re craving classic arcade action I’d recommend picking up one of the myriad arcade ports the Switch has to offer and leaving this wannabe alone.